A 3-hourly index of geomagnetic activity expressed in the logarithmic units on a scale from 0 to 9. Variations in Earth's magnetic field are measured by magnetometers. Any strong and sudden variations (up or down) in the X component (uppermost graph) are indications of VHF radio-auroral activity (e.g. on 144 MHz when variations suddenly peak, say, 300 nT). Class M and X flares affect the sunlit area of the Earth, causing increased D-region absorption. 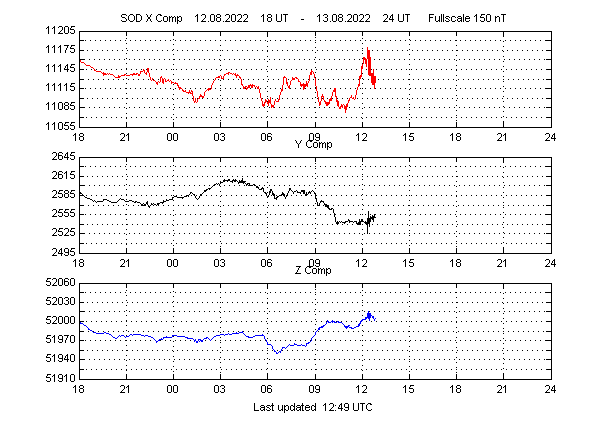 Strong flares are source of Shortwave Fadeouts (SWF) and Sudden Ionospheric Disturbances (SID). Look for the 1-8 Angstrom graph (red). High-energy protons are guided into the polar cap by Earth's magnetic field. Strong proton bursts are source of Polar Cap Absorption (PCA), i.e. high D-region absorption on paths passing through the polar areas. A proton event is in progress if the red curve crosses the threshold (dotted line) in the uppermost graph.